2nd Sense Audio presents Wiggle, a synth plug-in with a dynamic waveshaping engine and intuitive user interface. 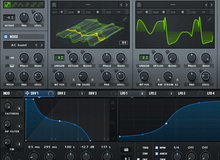 Cakewalk is offering special prices on Sonar upgrades and their virtual synths. Amazing Machines presents its AM102 Programmable Wavetable Oscillator for Reaktor, featuring a 16 Stages Wavetable. Cakewalk offers a free trial version of their Rapture Pro virtual synthesizer for Mac OS X and Windows. Cakewalk is at Musikmesse to introduce the Pro version of its Rapture virtual synthesizer for Mac OS X and Windows. Waldorf posted a video to announce the four new products that will be introduced at NAMM. It includes a Eurorack module. Soundsdivine completes the Waves Codex sound collection with the Other Voices preset library.